My issue with understanding comes down to the stock parameters of the charge controller / mt50. I get setting the amp hours to 220 but im not sure about the rest and would love to know if they need adjusted. To be clear in going by the flooded values. Thanks! If this is purely for keeping a full bank full, you might want to consider setting the "boost" voltage down to the same as float voltage. Going through this cycle every day isn't needed for a battery not in active use, and causes needless aging. If the controller has a setting to equalize every 'X' days, I'd set it to do so at the boost voltage every 14 days or so. This should be enough for acid mixing to avoid stratification, while also avoiding excessive gassing and water loss. If unattended, be certain the panel can't get shaded (eg by snow or leaves). Also, be sure to check water level before storing, and charge to full. Thanks. As far as the rest, it looks good? I thought a battery would be full at 12.6v or so, but this charge controller is wanting to bring it up to 13.8 volts or more. Is that normal? It should bring it up to 14.8 for a flooded battery then hold it there for absorption until full, then transition to float, ie 13.8. After dark the voltage should settle down to 12.8 or less depending on loads. Thanks. Just wanted to make sure it wasnt overcharging my batteries. 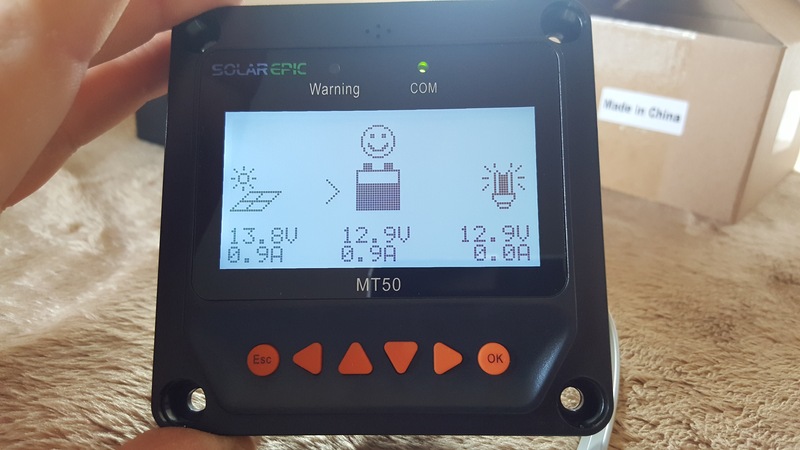 This the same as the EP SOLAR Tracer, the voltage of these units wander and setting the correct voltage for a true deep cycle battery is difficult. In 6 months I wasted enough fuel using a generator to top off my batteries I could have bought a Classic 150. I threw out the Tracers and bought a Classic 150. I haven't run the generator to top my batteries since. If they work for you then good enough. 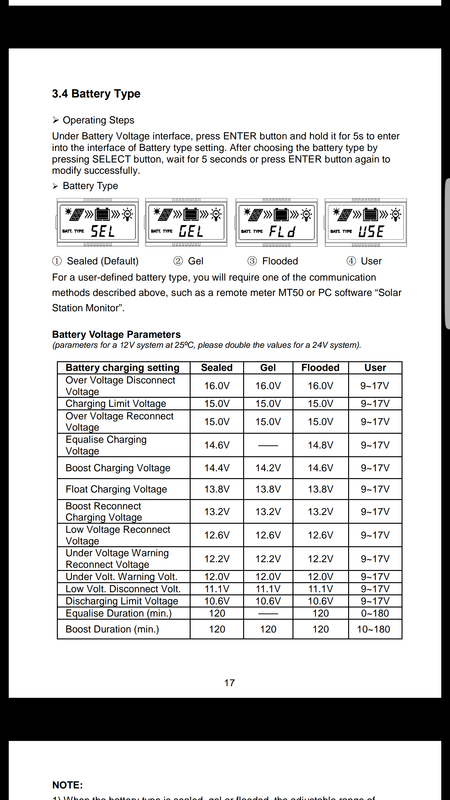 Correct bulk/absorb voltage for a true deep cycle is 14.4 for most and float is 13.6 volts The voltage presets on these are for an automobile combo start/deep cycle, not suitable for GC-2 or L-16 true deep cycle, they will leave such a battery undercharged.